stores and transmits lessons in electronic form on external drives, the cloud, local internet or external memory or server on the internet or intranet. includes content relevant to the learning objective. uses media elements such as words and pictures to deliver the content. uses instructional methods such as examples, practice, and feedback to promote learning. helps learners build new knowledge and skills linked to individual learning goals or to improved organizational performance. Inform programs or briefings: lessons that are designed to primarily build awareness or provide information. Performance programs: programs designed to build specific skills. 1. Receptive: information acquisition which involves low behavioral engagement and used for informing training goals such as new hire orientation. 2. Directive: response strengthening which involves medium behavioral engagement and used to perform procedure training goals such as software skills. 3. Guided discovery: knowledge construction which involves high behavioral engagement and used to perform strategic training goals such as consultative selling. Chapter 2: How Do People learn from e-Courses? 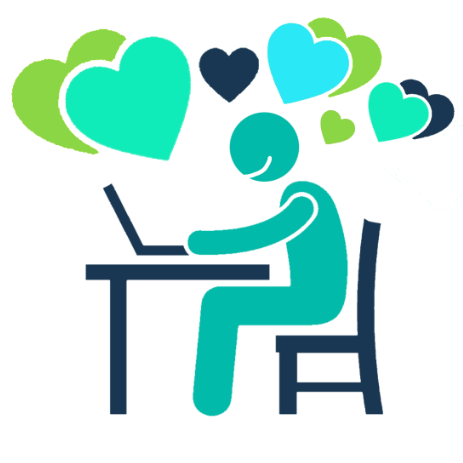 E-learning courses should be constructed by considering how the human mind learns and on experimental evidence concerning e-learning features that promote learning. Learning: learning is defined as a change in the learner's knowledge due to experience. This definition has three main elements: leaning involves change, the change is what the learner knows, and the change is caused by the learner's experience. Instruction: defined as the training professional's manipulation of the learner's experiences to foster learning. 1. Response Strengthening: learning is strengthening or weakening of associations. Learner is a passive recipient of rewards and punishments. Instructor is dispenser of rewards and punishments. 3. Knowledge Construction: learning is building a mental representation. Learner is a active sense-maker. Instructor is cognitive guide. Dual Channels: people have separate channels for processing visual/pictorial material and auditory/verbal material. Limited capacity: people can actively process only a few pieces of information in each channel at one time. Active processing: learning occurs when people engage in appropriate cognitive processing during learning , such as attending to relevant material, organizing the material into a coherent structure and integrating it with what they already know. 3. Integrating verbal and pictorial representations with each other and with existing knowledge. Essential processing: cognitive processing aimed at mentally representing the core material. Generative processing: cognitive processing aimed at deeper understanding of the core material (consistent of mainly organizing and integrating) and created by the motivation of the learner to make sense of the material and can be supported by instructional methods that promote engagement with the material. Extraneous overload: the amount of extraneous and essential processing exceeds the learner's cognitive capacity, that is the learner uses so much capacity on extraneous processing. Essential overload: the amount of required essential processing exceeds the learner's cognitive capacity. Generative underutilization: the learner does not engage in generative processing even though cognitive capacity is available, perhaps due to a lack of motivation. Instructional effectiveness-identifying the instructional methods or features that have been shown to improve learning. 2. When does it work? 1. Pure Applied Research- The goal is to be practical and to provide the most effective instruction. 2. Basic Research based on Applied Problems- It does not help just to pin point what works but to understand how it works and how to adapt to every situation. People learn from words and pictures than from pictures alone. 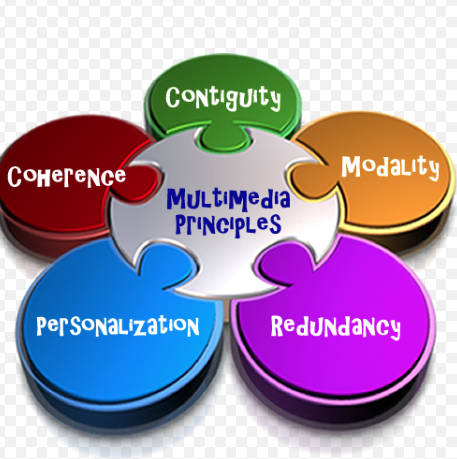 It is important to examine whether the multimedia principle depends on the experience level of the learners and whether it depends on the graphics being static or dynamic. A multimedia presentation contains both words and graphics. 3. Organizational, visuals that show qualitative relationships among content. 4. Relational, visuals that summarize quantitative relationships. 5. Transformational, visuals that change in time and over space. 6. Interpretive, visuals that make intangible phenomena visible and concrete. The Multimedia principle works best for novices. Present text and graphics in an integrated form. 1. Place printed words near corresponding graphics. Extraneous processing is cognitive processing that is unrelated to the instructional goal. Putting corresponding words and pictures far apart from each other creates split attention. Split attention forces the learner to use limited working memory capacity to coordinate the multiple sources of information. Split attention occurs when the learner continually has to look back and forth between two or more locations on the screen. 2 . Synchronize spoken words with corresponding graphics. Technical constraints on the use of audio in e-learing may lead consumers or designers of e-learning to rely on text to present content and describe visuals. However, when it's feasible to use audio, there is considerable evidence that presenting words in audio rather on screen text can result in significant learning gains. 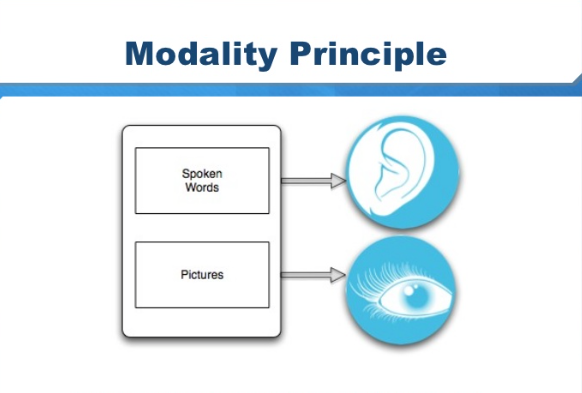 Presenting words in spoken form rather than printed form allows us to off load processing of words from the visual channel to the auditory channel freeing more capacity for processing graphics in the visual channel. Modality principle: present words as speech rather than on-screen text. Do not add printed text to a narrated graphic. According to the cognitive theory of multimedia learning, adding redundant on screen text to a multimedia presentation could overload the visual channel creating extraneous cognitive load. Redundancy effect, adding redundant on screen text to narrated graphics tends to hurt the learner. Consider adding on screen text to narration in special situations. Printing a few key words next to the corresponding part of a graphic can aid cognitive processing by diuretic the learner's attention a technique called signaling. Chapter 9 Applying the Personalization and Embodiment Principles. According the coherence principle, you should avoid adding any material that does not support the instructional goal. Weeding refers to the need to uproot any words, graphics, or sounds that are not central to the instructional goal of the lesson. 1. Avoid e-lessons with extraneous words. 2. Avoid e-lessons with extraneous graphics. Extraneous graphics can interfere with learning in three ways: distraction, disruption, and seduction. 3. Avoid e-lessons with extraneous audio. People learn better when e-learning environments when e-learning environments use conversational style of writing or speaking. People learn better from online agents that use human like gesture and movement. On screen characters who help guide the learning process during an e-learning episode. Behavioral Engagement refers to overt actions taken by a learner during a lesson intended to improve learning. Psychological Engagement promotes learning that helps learners to achieve the instructional goal by engaging in relevant cognitive processing during learning. 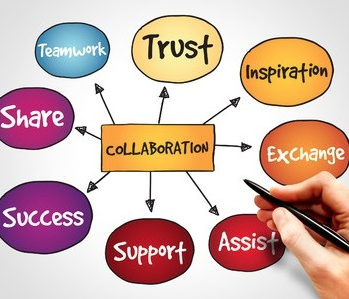 Collaborative learning involves teams of two to six individuals working tougher to accomplish a goal in form of a project or lesson. For example, social learning. Cooperative learning will improve student achievement in most subjects. Thinking skills can be specific skills that include analytical thinking, problem solving, drawing conclusions based on data analysis, communicating findings and decision making. Transfer skills refers to skills that are performed more or less the each time. Engagement is defined as meaningful psychological interaction between the learner and the instructional environment that promotes the learning achievement of the learning goal. Engagement may support building relationships between new content and prior knowledge and or among content elects in lessons. 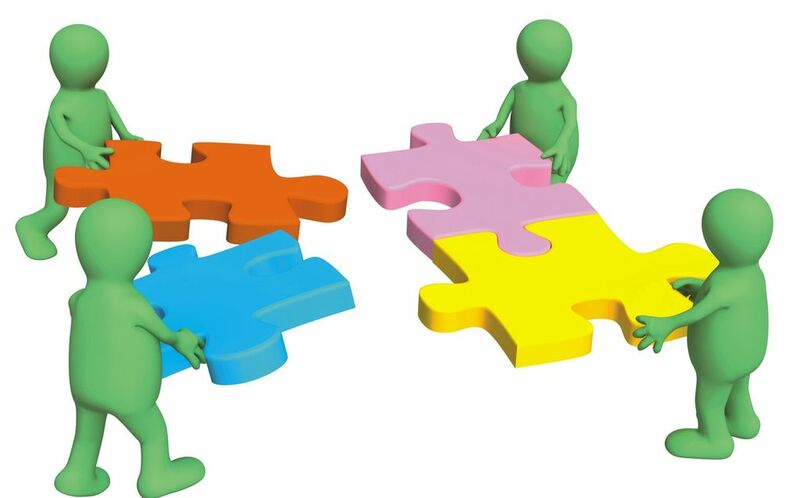 Consider collaborative assignments for challenging tasks. ensure that learners know the names and characteristics of key concepts. Which is NOT a characteristic of e-learning? e-learning can be done through digital games. Information acquisition which involves low behavioral engagement and used for informing training goals such as new hire orientation. receptiveguided discover information acquisition which involves low behavioral engagement and used for informing training goals such as new hire orientation. What are three ways to acquire information? 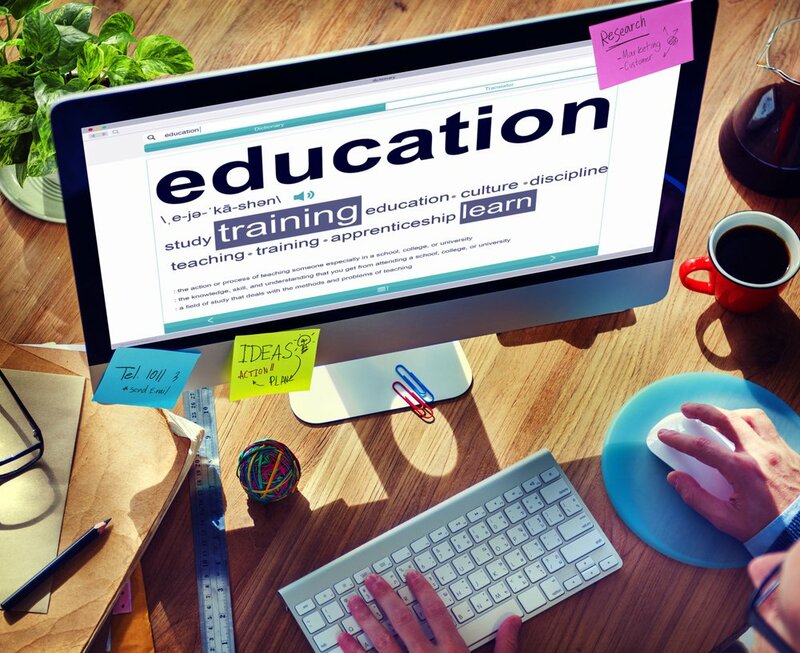 Objective 2:Instructional Design ; What is it ? Its purpose? What is its use in HRD? One of the 3 main purposes of Instructional Design states "to establish how instructional effectiveness will be evaluated". Determine if the statement below is True or False. Does an instructional method cause learning? Does an instructional method work better for certain learners, materials, or environments? What learning processes determine the effectiveness of an instructional method? -Practical Research (Applied Research) is aimed at contributing practice. For example, determining what works in improving instruction. 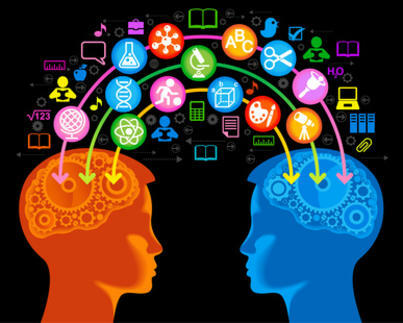 -Theoretical Research (Basic Research) is aimed at contributing to theory. For example, determining how learning works. The model integrates andragogy (Knowles) and experiential learning (Rogers) and lifespan psychology. •Adult learning programs should capitalize on the experience of participants. •Adult learning programs should adapt to the aging limitations of the participants. •Adults should be challenged to move to increasingly advanced stages of personal development. •Adults should have as much choice as possible in the availability and organization of learning programs. •The dual coding theory proposed by Paivio attempts to give equal weight to verbal and non-verbal processing. • "Human cognition is unique in that it has become specialized for dealing simultaneously with language and with nonverbal objects and events. Moreover, the language system is peculiar in that it deals directly with linguistic input and output (in the form of speech or writing) while at the same time serving a symbolic function with respect to nonverbal objects, events, and behaviors. Any representational theory must accommodate this dual functionality." (p 53). 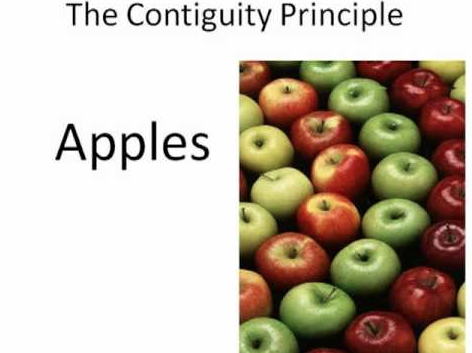 •The theory assumes that there are two cognitive subsystems, one specialized for the representation and processing of nonverbal objects/events (i.e., imagery), and the other specialized for dealing with language. 1.Representational, direct activation of verbal and non verbal representations. 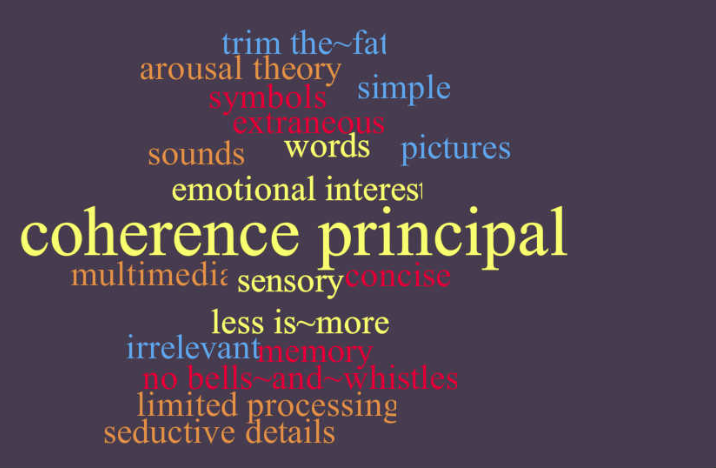 2.Referential, the activation of the verbal system by the non verbal system and vice versa. 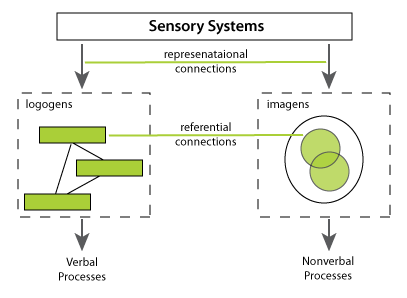 3.Associative Processing, the activation of representations within the same verbal or non verbal system. 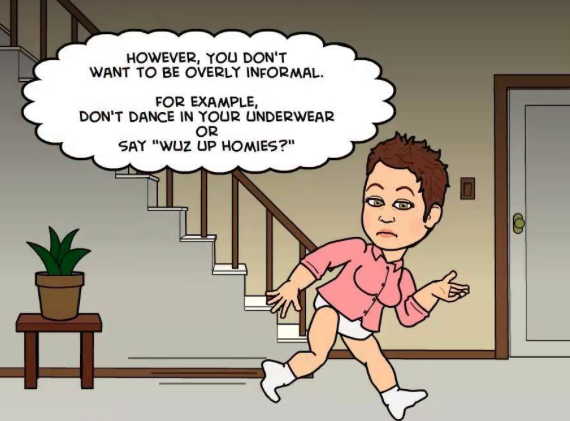 •Emphasizes the importance of observing and modeling the behaviors, attitudes, and emotional reactions of others. •From observing others, one can get an idea on how new behaviors are performed. •The component processes underlying observational learning are: attention, retention, motor production, and motivation. •The highest level of observational learning is achieved by first organizing and rehearsing the modeled behavior symbolically and then enacting it overtly. Coding modeled behavior into words, labels or images results in better retention than simply observing. •Individuals are more likely to adopt a modeled behavior if the model is similar to the observer and has admired status and the behavior has functional value. •Bandura, A. (1997). Self-efficacy: The exercise of control. New York: W.H. Freeman. •Bandura, A. (1986). Social Foundations of Thought and Action. Englewood Cliffs, NJ: Prentice-Hall. •Bandura, A. (1973). Aggression: A Social Learning Analysis. Englewood Cliffs, NJ: Prentice-Hall. •Bandura, A. (1977). 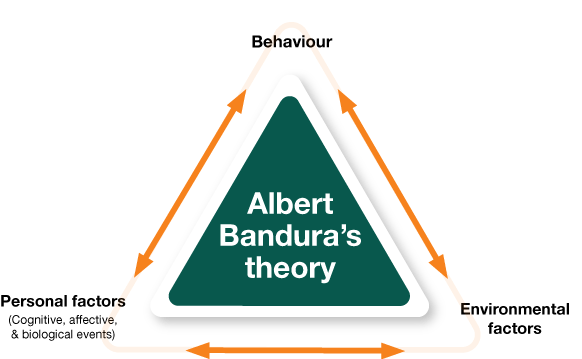 Social Learning Theory. New York: General Learning Press. •Bandura, A. (1969). Principles of Behavior Modification. New York: Holt, Rinehart & Winston. •Bandura, A. & Walters, R. (1963). Social Learning and Personality Development. New York: Holt, Rinehart & Winston. •Miller, N. & Dollard, J. (1941). Social Learning and Imitation. New Haven, NJ: Yale University Press •Cross, K.P. (1981). Adults as Learners. San Francisco: Jossey-Bass. •Cross, K.P. (1976). Accent on Learning. San Francisco: Jossey-Bass. •Clark, J. M. & Paivio, A. (1991). Dual coding theory and education. Educational Psychology Review, 3(3), 149-170. •Paivio, A. (1971). Imagery and Verbal Processes. New York: Holt, Rinehart & Winston. •Paivio, A. (1986). Mental Representations. New York: Oxford University Press. •Paivio, A. & Begg, I. (1981). The Psychology of Language. New York: Prentice-Hall. The ADDIE model is an acronym that stands for Analyze, Design, Develop, Implement and Evaluate. ADDIE represents a dynamic, flexible guideline for building effective training performance support tools. Analysis: The first step in the ADDIE model is to figure out what the instructional problem is. This is where the instructional goals and objectives are established. In this stage there needs to be an identification of the audience they are trying to catch and their prior knowledge. Identify the new behavioral outcome. Develop: The third step in the ADDIE model where the context is created and develop that was created in the design phase. The development stage is where the project is reviewed and revised according to the feedback that the developers have. 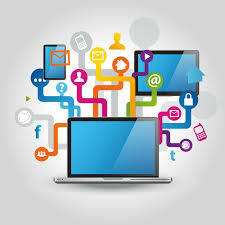 This includes design of storyboards and graphics, as well as integration of any eLearning technologies. The actual creation of the content and learning materials based on the design phase is processed. Implementation: The fourth step in the ADDIE model is when the plan is put into action. Material are delivered or distributed to the target audience and the learning process starts. After delivery, the effectiveness of the training materials are evaluated. There are three steps that should be thought of when the Implementation stage is in progress. Evaluation: The fifth and the final step in the ADDIE model plays an important role in the ending process. There are two different types of stages in evaluation step; the Formative and Summative phase. The Formative phase happens when evaluating the quality of the learning materials and the people receiving the information. The Summative phase consist of the feedback from the users that hope to gain positive feedback in the training performance, this includes the instructor and the learners. First step in ADDIE. Presents instructional goals and objectives. Identify learning environment and learners existing knowledge and skills. Second step in ADDIE. Learning objectives, lesson planning and content selection. Context is created and develop. This phase includes storyboards and graphics. Training and plan is put into action. Materials are delivered to the learners. Consist of two parts; Formative and Summative. This phase tests designed for domain specific items and feedback from the learners. The analysis stage is very important because it is the beginning of the ADDIE model and informs who is going to be the audience of the training materials and what they will be learning. In order to have a successful ADDIE, the Analysis stage needs to be successful and really understand what the goals for the training are. The Design stage is after Analysis that set goals and begin a structure for the training. The Design stage includes the audience and how to present the information through the format of the course, developing the education strategy and evaluating results. Without the Analysis stage there would be no Design stage. Development stage is where all the information from the previous stages come together. This is where the storyboards and detailed description of course elements are created. The Development stage includes the target audience and the information that is in the Design phase and the Analysis phase. In this phase the target audience, that was introduced in the Analysis stage, interacts with the course that is presented in the Development stage. In this stage the instructors need to be trained, making sure they know who and what they are going to be saying in the training course that was in the Development phase. The information that was presented in the previous stages all go into this fourth stage. This is the last and final stage that allows the learner to give their feedback on the training they got. This stage trainers see if their training materials had a positive effect or not. This is done by the targeted audience that was present in the Analysis stage. Without all the previous stages the evaluation would not be able to have any feedback. This survey is located at the bottom left of every screen during this portion of the course. I encourage you to fill it out each and every time as your answers may change- which is perfectly fine! This course was created to help you to think like the designer of an e-learning instructional course. The reason why it is a survey and not a graded test will be answered in the following slides. Identify the 5 W's and the H by answering the following questions associated with each term. Who: Who is the training for? What are the individuals' ages? How big is the group? What are the ethnicity and race(s) of the trainees (depending on the purpose)? What: What is this training about? What is in the contents of this training? What is appropriate for this audience? When: When should this training take place? When are the busy seasons for this company? When is the off season? How: How do you plan to keep the audience engage? How do you plan to deliver the training? How do you plan to make the most effective lesson plan? How do you plan to split up the content? Provide your thoughts after reading: "Let's Get You Thinking." What are your initial ideas on implementing this training? You are the Human Resources Development Director at Delta Airlines and you are responsible for creating an ethics training for the flight attendants because of the recent compliments about racism throughout the nation. Keep in mind, it is very difficult to summon every flight attendant that works for Delta into ONE classroom however the major hubs are Atlanta, Georgia; Detroit, Michigan; LaGuardia, New York; Houston, Texas. 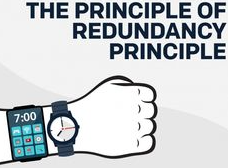 For example, you would not design a 12 week e-learning course that requires the students to log in every Thursday evening at 5:00 pm- Central Time-when approximately 100 employees work during that time across the nation. Nevertheless, that e-learning course may be ideal for a small company that puts aside an hour for the course before departing for the day at 6. The tools differ EACH & EVERY time when designing a new course. However, in order to ensure success, be sure to answer the questions identifying the 4 W's and the H before outlining an e-learning course. Lastly, sometimes JUST e-learning courses may be useful but not sufficient. For example, let's go back to the Delta Airlines training course. The best way to ensure that everyone receives the training is to design a mandatory e-learning course due to the mass numbers of flight attendants as well as the mass amounts of airports located throughout the United States. It would be difficult to have one training at one airport. However, the hubs were listed to consider having a designated training at each hub. 1. Design a mandatory e-learning course so flight attendants can complete the course at their own pace, at a flexible time for them, and to receive a base understanding of the importance of diversity and ethics awareness. 2. Create face-to-face trainings at the major Delta Air Hubs -Detroit, Atlanta, Houston, New York- for a duration of 6 months so all Delta flight attendants have a chance to participate in the training. The reason for this is because the topic is a very serious and sensitive; an e-learning course will desensitized the topic and not emphasize the importance of the matter.